Good luck getting ME to a party. I’m disturbed that the introverted fellow isn’t more concerned over the fact that a full-grown shrub has invaded his living room. Bring me a shrubbery!! Ni! Why did the extrovert devour the book and speak like he failed out of high school? Some of us are very intelligent and just happen to be extroverted. 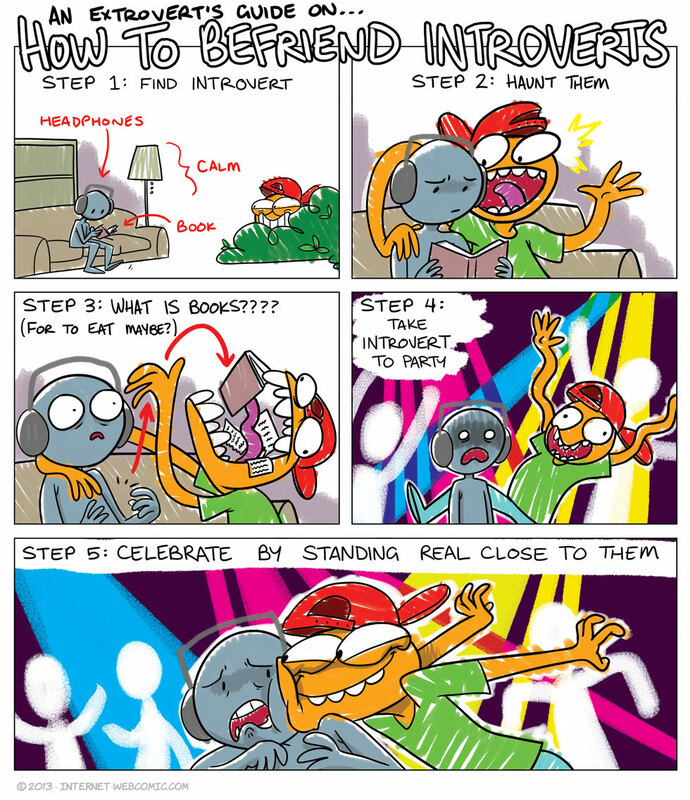 Because this is mostly a reactionary comic meant to exaggerate the portrayal of extroverts in those patronising “how to treat introverts” things that go around. Most of them heavily imply that introverts are the only people who enjoy reading books. This is definitely how we became friends. if it was me. the extrovert would be sent in hospital right from panel 3 already. NEVER touch or damage somebody else’s (me) stuff, unless you got tired of having sane limbs. I should have wrote healthy. Italian and english both have so called “false-friends” words wich are similar aspect, but different meaning. superficiality knows no age nor grade. That’s why I learned to use firearms. Actually, some of my best acquaintances were extroverts. They were great at keeping up a conversation so I felt way less pressure to try and talk and junk.